The Project Acceptance Simple Signoff Form is used for the client and developer to sign off on the final acceptance of the project. Use this form when the project is complete and both parties agree that the project conforms to the terms of the contract. This is a short form version. This Project Acceptance Simple Signoff is included in editable Word format that can be customized in Word or by using the included Wizard software. Contract ID: Contract Reference Number. General Description of Project Deliverables. I certify that I have received all project deliverables from Company Name, and that all deliverables have been demonstrated, delivered or otherwise completed to my satisfaction. I further certify and release Company Name, from any further obligation, support or duty concerning this project, including any and all continued support services. I understand that by signing this agreement, I release Company Name from any and all liability, tort or claim concerning this project, its files, source code, object code, programming or other materials, whether printed or digital, provided to client. I further understand that all files provided to me under this or any other agreement are to be used at my sole risk and responsibility and all files should be tested prior to publication or any mass distribution in any format. Company Name is not responsible for any results obtained from the use of any software, materials, presentation or products provided to client under this agreement. 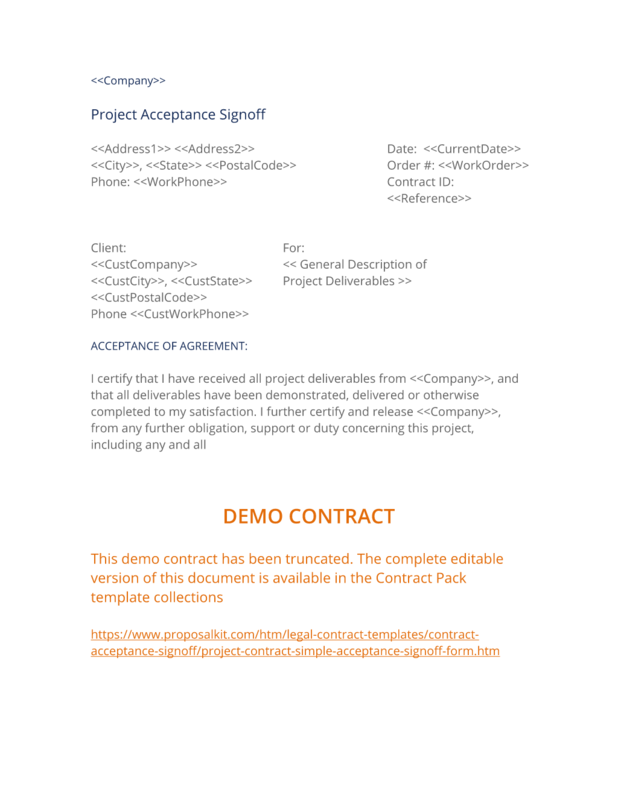 The complete Project Acceptance Simple Signoff - with the actual formatting and layout - is available in this Contract Pack.